It’s finally summer break! Seldom have I been so excited for summer break to arrive–maybe when I was a little kid? I’m going to clean my house, I’m going to get my business affairs in order, but mostly? I’m going to paint! In case you hadn’t noticed, it’s my new passion. I’d love to hear about your newest passion! What challenges do you face as you work on it? How did it come to be your passion? Please do leave a comment and tell me your story. A couple of days ago I was inspired to attempt some of what I call abstract art. Some people call it non-observational, and some call it non-representative. Aroseisaroseisarose, don’tcha know. I call it FUN! Yes, it’s hard work to do it right, and I have much to learn about it, but it’s still full of joy and fun. Makes me merry. Here it is in it’s current form…it may or may not be finished. It was watching this video that inspired me to try this relatively new style of painting–I’ve attempted an abstract about 3 other times. Believe it or not, my very first one sold almost immediately…I’d never sold a painting at all before! Humans are naturally playful, it seems. And yet as adults playfulness may seem a waste of time and energy; a luxury that we can’t really afford. Focus, efficiency, and problem solving seem to be the best use of our time. As it turns out, however, playfulness has hidden benefits. researchers who have recently [begun researching playfulness] are discovering… that playfulness, as a personality trait, is not only complex but consequential. People who exhibit high levels of playfulness—those who are predisposed to being spontaneous, outgoing, creative, fun-loving, and lighthearted—appear to be better at coping with stress, more likely to report leading active lifestyles, and more likely to succeed academically. Hold on a minute, though, before you grab your iPhone and start a game or call your tennis buddy up to schedule a play date. The article quote above is careful to note that the point is to engage in playfulness. This will likely be different activities for different people, but the attitude itself, the inner feeling of “cheerful, frisky, frolicsome, good-natured, joyous, merry, rollicking, spirited, sprightly [and/or] vivacious” playfulness is the goal. If your iPhone or tennis game do not invoke that feeling…you may not reap the same benefits. Today I found my playfulness again, even more intensely than when painting abstractly. It was a surprise and a delight. Here is how it happened. And so I did! It was amazingly delightful…I found myself feeling like a kid again…tongue stuck out, silly grin on my face, just…playing. Creative ideas for applying the pastel and gesso flowed and I let myself go and try them. 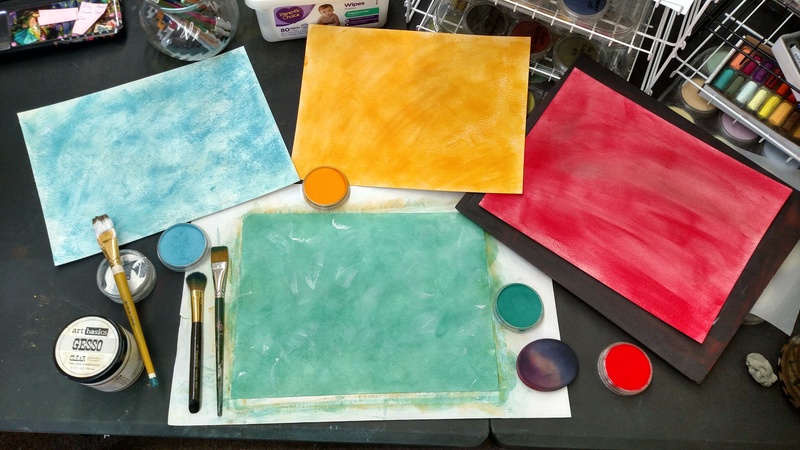 In case you are interested in trying this for yourself, here are the details: Arches watercolor paper, PanPastels in assorted colors, clear gesso, assorted brushes for applying color and gesso. It took a couple tries to figure out the best way to apply the pastel…the Arches was a little rough for the regular Sofft brand sponge. Then I tried a regular flat brush (green handle), which worked but was a little uneven and slow, so I tried a weird little brush that came free with an order from Jerry’s artarama (brown handle: supposed to be for blending pastel). 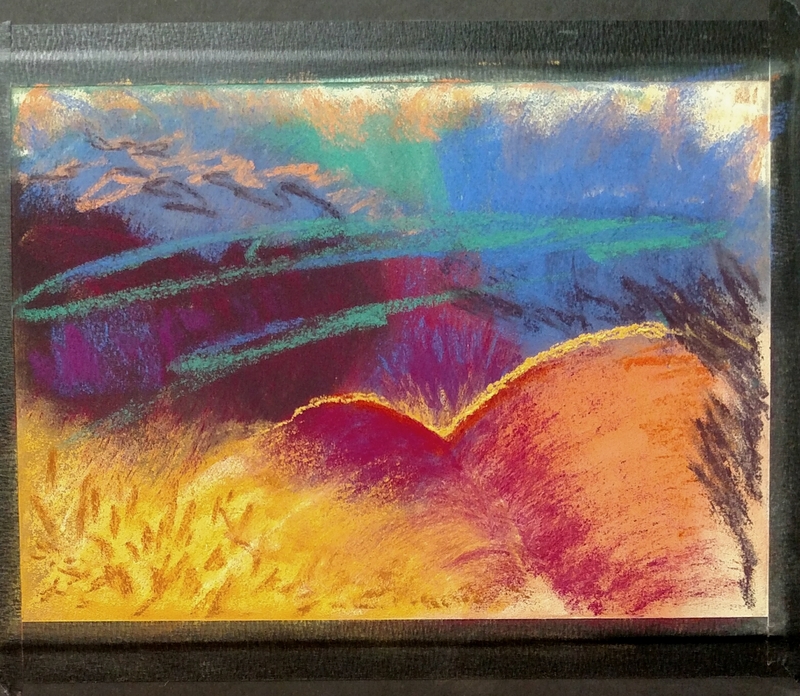 It worked great to simply turn the pan up on it’s side and brush the pastel powder onto the paper, then rub it in using the brush: that’s the orange colored paper. Once I discovered that, I decided to do less rubbing in on the turquoise, leaving dots and blotches. That was super fun! I have already used the red one (that was specifically made for the lesson I was painting through. I can’t wait to try the others–I just chose whatever color I thought I would like, with no plan about how I might use it. Stressed? Feeling toxic? Lacking creativity? Why not seek your playfulness…it’s probably right where you left it. Let me know if you find it and use it; I’d love to hear how it went.